2020 Mercedes-Benz GLS - full-sized X7 rival leaked! Home » Cars » 2020 Mercedes-Benz GLS – full-sized X7 rival leaked! Mercedes-Benz is close to unveiling the latest generation GLS SUV, this time setting its sights firmly on rival BMW X7. This set of photos (courtesy of Almuraba) reveal what appears to be the production version of the automaker’s largest SUV, with design clearly inspired by the smaller V167 GLE. Up front, the car wears the same octagonal-shaped radiator grille with dual chrome bars, although they each feature six slats compared to the four on the GLE. The slim LED headlights and lower apron are similar, though it’s clear as day that the GLS’ side profile is noticeably longer. Behind, again, the GLS takes after the GLE with use of sleek LED tail lights, with the former now featuring all-new graphics. Unlike the GLE, there’s no clever use of windows to mask the rear section’s overall bulk, so make no mistake, the GLS will be huge. It’s the same story inside. The cabin gets twin 12.3-inch displays linked to the latest Mercedes-Benz User Experience (MBUX) infotainment system, three-spoke steering wheel with black panels and wooden inlays, as well as a dash layout that looks a lot like the GLE. For platform, the luxury seven-seater sits on the automaker’s latest Modular High Architecture (MHA) platform, which it shares with the new GLE, and is expected to bring considerable weight savings over the previous model of equivalent specification. 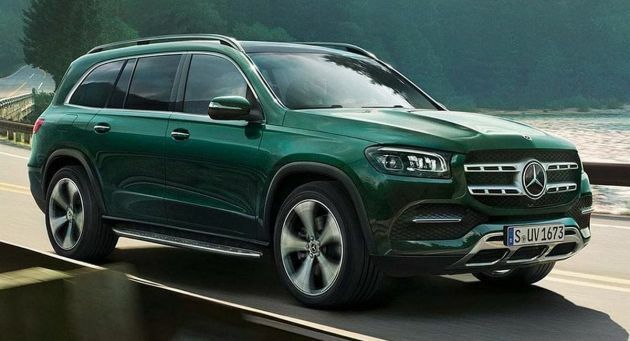 There will be use of four-, six- and eight-cylinder engines, the latter two being the most likely types of engine size, given the size and positioning of the GLS. The platform allows for rear- and all-wheel drive configurations, and electrification is all but certainly catered for. Both petrol and diesel versions of the inline-six powerplant family are likely to feature here, as is the 4.0 litre biturbo petrol V8. Yet to be confirmed but also likely is an AMG version, which should employ a higher-tuned version of the M176 biturbo V8. The previous GLS 63 – and GL 63 before it – was powered by the firm’s 5.5 litre biturbo V8.